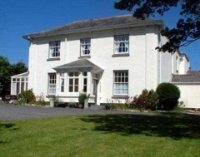 Rezare Farmhouse bed and breakfast is situated in a quiet, peaceful hamlet within the Tamar Valley on the Cornwall / Devon border, an unspoilt area, untouched by mass tourism. 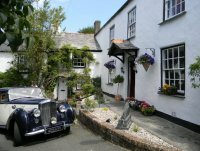 Our comfortable, characterful, 17th century farmhouse is located midway between Launceston and Callington, Bodmin Moor and Dartmoor, and both coasts. You will be perfectly placed to explore all that this region of the South West of England has to offer. 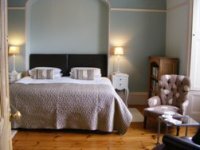 We offer B&B accommodation with a particular emphasis on good food and sustainability, all rooms ensuite, and we are dog friendly. Our aim is that you should enjoy unhurried hospitality in relaxed, informal surroundings. Gastro pub nearby. Contact Colin and Michael. 'Out in the Open' evolved almost by accident. We, (like a lot of farms in Cornwall), set up a campsite for the solar eclipse in 1999 & after this, we decided to remain open as a gay campsite. Back then, it was difficult & sometimes uncomfortable, to be yourself in public & for some people, it still is. However, things have moved on & times have changed. We do these days, actively welcome all campers, regardless of sexuality. This was never intended to be your average commercial campsite. It is managed entirely by just the two of us. We don't cram as many people in as possible & although we have acres of space, we deliberately limit numbers in order to maintain a friendly, quiet & respectful community atmosphere. Out in the Open offers the chance to escape a busy lifestyle, relax & slow down the pace. There are stunning views, great facilities & you can take as much space as you need. But, if you're looking for late nights, club houses, games machines, widescreen TVs, cruising, or partying, then its not the site for you! We are situated just 15 minutes walk from the village of Porkellis, between the towns of Falmouth & Helston in Cornwall. The farm is at the end of a track; away from roads & is both peaceful & private. The campsite has uninterrupted moorland views by day & a blanket of stars in the sky at night. We are in a central position for easy access to both the north & south coast beaches & major tourist attractions. Please be aware that, due to a narrow access lane, we can only cater for tents & small campervans - anything larger than 7' wide will not get down the track! 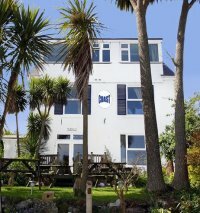 Lesbian owned and run, Coast B&B is a guest house for accommodation in Carbis Bay, St Ives, Cornwall. As well as the bed and breakfast, there is a vegetarian restaurant and cafe, therapy suite and art gallery. A short walk to the beach with views overlooking the bay. A holiday chalet and holiday bungalow are also available to rent in this beautiful region of South West England. Coast is a vegetarian bed and breakfast based in Carbis Bay near St Ives in Cornwall, South West of England, UK. It is also home to the popular 'Bean Inn Vegetarian Restaurant', Hypnotherapy from Gail Richards and the Wild Planet Art Gallery, displaying the work of local Cornish Artist Katrina Slack. At Coast we aim to be different. We are unique because we are more than a B&B, but not a hotel. Your experience is what you make it. We provide the bed and breakfast and offer you a world of choice and opportunity. You could order take-away lunches, dine at our restaurant and buy art from the gallery. Enjoy our relaxed and friendly atmosphere and explore the wonders that Cornwall has to offer. Coast provides free parking and our guide for those coming by bicycle and public transport. 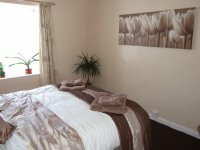 "Lesbian owned / Gay Friendly"
Lesbian owned and run delightful 16th century Grade II Listed guest house, close to the coast, offering a friendly welcome, quality accommodation and excellent food. Ideally situated for exploring Cornwall and Devon, walking, cycling, golf, bird watching, surfing - or just unwinding, Stratton Gardens is a peaceful hideaway, only 1½ miles from Bude's sandy beaches. Enjoy our secluded gardens, comfortable lounge with open fire and licensed bar. Our delicious, locally sourced breakfast includes vegetarian and gluten free options. All of our spacious, en-suite bedrooms have digital television and wi-fi access. Parking on site. Gay owned and run Hotel between Mevagissey and Portmellon Cove close to Coastal Path, beaches, Eden Project and Lost Gardens of Heligan. 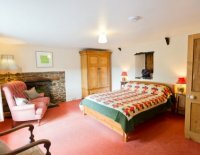 All rooms ensuite, tastefully furnished with either sea or country views. Outdoor heated swimming pool, private garden, sun terrace, conservatory, guest lounge, bar, dining room / restaurant offering dinner every evening using fresh local produce. Ample guest private parking. "Gay Owned/ Gay Friendly"